This story starts in Italy and will then take us to the Tarim Basin in Northwestern China. It features a well-known mummy (Oetzi) and one of the best preserved mummies in the world (The Beauty of Xiaohe). 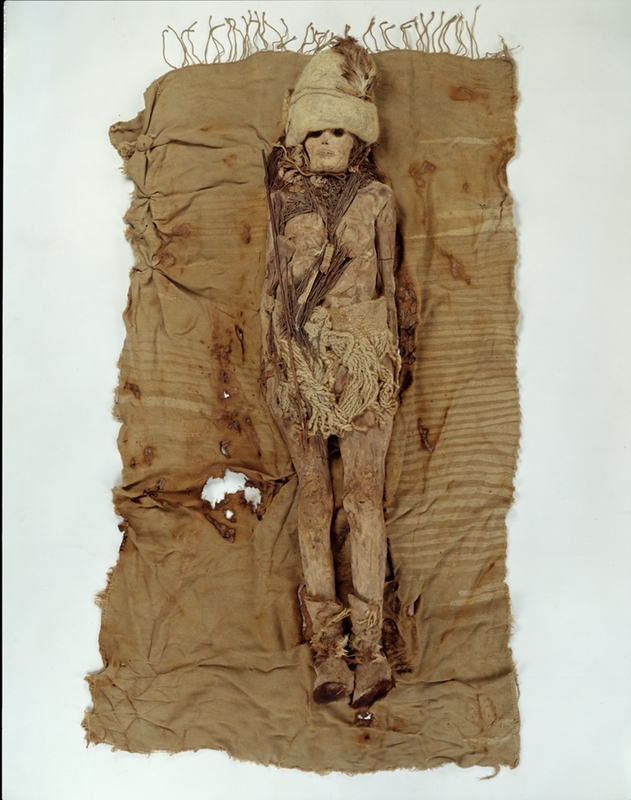 It contains data from in-depth DNA analysis performed on one mummy and holds the promise of similar date generated in the near future on another set of mummies. Fasten your seatbelts, here we go. During the month of August 2010, several stories hit the wire that the DNA of Oetzi, the famous Iceman mummy had been sequenced. The Iceman was discovered emerging from a glacier on the border between Austria and Italy. His mitochondrial DNA is now the oldest complete H. sapiens mtDNA genome generated to date. This is where we segue to the Tarim Basin mummies, discovered thousands of miles away from the Alps. As it turns out, Oetzi’s find spot was very close to Alpine pastures where Dr. Victor Mair’s family once took their animals to graze, and that brings us to the Tarim Basin Mummies, a long term focus of Dr. Mair’s research. A gratuitous link between these two areas, you say? Not necessarily, if one considers what has just been announced in Italy and the potential of what could happen with the mummies in China. Moreover, one of the reasons Dr. Mair got to be so interested in ancient human remains was the discovery of Oetzi in 1991. This occurred a few years after he had seen the Tarim Basin mummies on display in a museum in Urumqi. The Beauty of Xiaohe. Courtesy of the Xinjiang Uyghur Autonomous Region Museum in Urumqi. Oetzi is of European origin; the Tarim Basin Mummies are often referred to as Eurasian, and Caucasian, without much further information about where they may have originated from, other than “west of the Pamir mountains.” This is where the reference made above, to the potential of future research comes in. The techniques exist to investigate the Tarim Basin mummies in much greater detail. The research has not happened yet. In addition, there are ways to establish where individuals were born and raised, one of the most famous examples being the remains of an archer found close to Stonehenge. Tests showed that he originated in the Alps, probably Switzerland, Austria or Germany. He somehow made his way into what is now the United Kingdom, where he was buried. A similar scientific approach could be applied to the Xiaohe remains. I am sure that one day this will happen. Currently the Beauty of Xiaohe is receiving visitors at the Houston Museum of Natural Science. Oetzi, on the other hand, remains safely ensconced in his refrigerated display unit in Bolzano, Italy. No word yet if he is interested in coming over to visit his long lost relative. Don’t miss Secrets of the Silk Road, open now at HMNS. See strikingly well-preserved mummies, tall in stature and fair in complexion, that have lain in the parched Tarim Basin of western China for 3,800 years along with 150 objects drawn from the Xinjiang Uygur Autonomous Region Museum and the Xinjiang Institute of Archaeology in Urumqi. To Dirk Van Tuerenhout; Thank you for being so gracious when I met you in the exhibit area last Sunday. Our discussion was a highlight of my visit. I have noticed that the illustration shown above, and one from the California museum, displayed the Xiaohe woman with her shroud open. The display here in Houston has her displayed with the shroud covering her body, with only her face peering out. Was this a decision made by the Chinese officials? Was it based on environmental factors, available floorspace, or more local cultural concerns? Is there a different for various ways to display her? I look forward to your reply, and thank you again for your time last weekend. Correction: Is there a different protocol for various ways to display her? A pleasure meeting you and talking to you. You had some good questions. The image of the Beauty of Xiaohe as shown above shows her with her cloak open. However, the Houston Museum of Natural Science is displaying her in exactly the same way as the Bowers Museum did: with her cloak closed. I think a very strong argument in favor of having her displayed this way, rather than with an open cloak, is that she would have been buried with her cloak closed. The same applies to the infant, whose remains are shown nearby. Thanks again for visiting. Please tell your friends about the exhibit. Previous Post Sleep Tight, Don't Let the Bedbugs Bite! !